It’s an adage so common it can seem trite. So simple that it’s hard to believe it can matter. Bad things happen to good people. Sometimes those things are just natural disasters. Floods. Hurricanes. Wildfires. And sometimes, they’re deliberate actions taken by others—sparked by ignorance, fueled by hatred, and dictated by fear. The recent barrage of bullets in Christchurch is one of those actions: a prejudice-inspired crime that resulted in the deaths of 50 innocent people, slaughtered as they worshiped. The pain and grief suffered by the victims and their families is overwhelming to imagine. But while we ponder how it is that one human being—any human being—could commit such a heinous act, let us not fail to notice the sympathetic, kind, and loving outpouring that people of goodwill have extended to those suffering from intense pain and grief. It should come as no surprise that the global religious community has been a major force of support, compassion and love in the face of hate. Within hours of the attack on the New Zealand mosques, close to a thousand people in Australia—Muslims and non-Muslims alike—went to Lakemba Mosque in Sydney to join together in prayer. For the first time in history, the New Zealand Jewish community closed its synagogues on the Sabbath in an act of solidarity with the nation’s Muslims. Members of Guru Nanak’s Free Kitchen Auckland, a Sikh volunteer organization, are volunteering to provide food and funeral assistance to Christchurch’s Muslim community. If there is a lesson to be learned from this unspeakable crime, I feel that it must, indeed, be that simple one. The outpouring of love and compassion didn’t stop “down under.” Across the globe, solidarity, prayers and kindness were offered by members of all faiths to the New Zealand Muslim community. 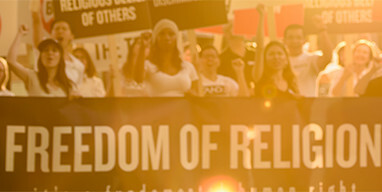 Shoulder to Shoulder, a U.S. coalition of 35 religious denominations and faith-based organizations, issued a statement calling on people of faith to show solidarity with the Muslim community, urging their supporters to counter the irrational fear shown by anti-Muslim terrorists with education and truth. Across the United States, Interfaith Vigils began over the weekend and continued, as more and more people of faith join together to combat the evils of hatred and fear. Truthfully, there is no more effective response to hate. Love one another. Protect, defend, stand beside and stand up for one another. Cry together, and rebuild together. But above all else, remember to love.